What is the user ranking by voting? 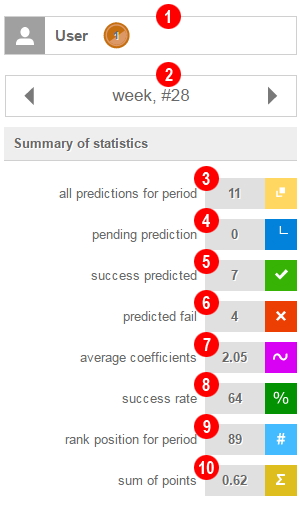 This ranking represent an ordered list in a table view of the users' votes and additional extracted information about the votes every user favored in www.statarea.com. When a user votes by clicking 1 or X or 2 the user obtain points, which depend by the success or the failure of his choice for the full time of the match. The total points can increase or decrease (even below zero) whether the user's votes are successful or not. Continue reading to understand how the points are computed. - weekly rankinng - only points in the current calendar week (Monday to Sunday) are taken for the rankings. - monthly ranking - only points in the current calendar month (1 till the last day 28/31, depends on the month) are taken for the rankings. Each vote gives the user opportunity to be in the rankings, so by favoring one of the votes 1 or X or 2, your points will be changed respectively for the two current rankings - weekly and monthly. The weekly and monthly rankings show only the first 20 users for clarity. It does not mean the ranking is consisted with only 20 users. Every user can check its position in the rankings, even if it is not included in the top 20, here: Which place I'm in the rankings?. Those rankings are very important and give you the User new opportunities and options, which could be of a great value. Apart from the the competitive intention, for example now the users of www.statarea.com can track those among us, which are the best, and reuse their knowledge. It is important to note the time of the match is taken for the rankings, not the time of making the vote, for example if a user makes a vote today for a match after a week the value of the vote will be computed in the next week rankings. The time of the match is considered in UTC (Coordinated universal time) - so some matches may look to the users as if they were played on the next or previous week, but they were not. The most important are the user points, the rankings are built by them with the most ones at the top in the descending order. If the points are equal the success percentages are taken (the higher one is above) and if the points and the success percentages are equal the most number of votes is taken for the rankings. Who can participate in the rankings? What are the terms to participate? 1. to be a registered user. 2. to have have at least 5 votes for rankings the user wants to be part of. The participation in the rankings is absolutely free and there are no consequences or commitments for the user. As well as to be part of the rankings is voluntary and not mandatory. How to vote for a match? In the end of the match's line there is the voting section. 1. button "1" - win for the first (host) team (in the example: Borussia Dortmund) in the full time of the match. 2. button "X" - draw in the full time of the match. 3. button "2" - win for the second (guest) team (in the example: Bayern Munich) in the full time of the match. By clicking one of the above buttons the user makes a vote. In the right column users can see the accumulated count of the votes till now. Upon successful voting the user will increase the count by one and after that the three buttons become inactive. IMPORTANT!!! The user can vote only once! With the ranking of the match, the voting section becomes inactive! How the points are computed? The points are computed base on the fact the user only earn the amount above the initial bet, which is always considered to be ONE. And when someone vote fails to predict the result the user will lose only the bet, as already mentioned the bet is always considered to be ONE point. 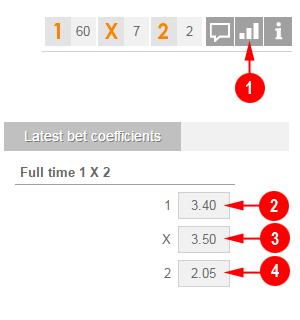 The coefficients, related to points for the current match, the user can see them by clicking button 1. If the user votes by "X" for the current match and the match ends in the full time with a draw, the user's total points will be increased with 2.50 points. If the user votes by "1" for the current match and the match ends in the full time with a draw (or guest team wins), the user's total points will be decreased with 1.00 points. IMPORTANT!!! Do not vote or click at large, because it likely will make your total points negative number! Make your informative choices! The betting coefficients change all the time. Detail report how the user's points in a current ranking are computed can be viewed by clicking over the name of the user. What does it mean the number in the rankings? Each line represents the accumulated vote results of each user. I voted, the match ended, but no points processed for me? The rankings and the user's points are not processed immediately upon the end of the full time of a match. The processing is done in the beginning of every hour, so the user's vote can be computed with a delay. I have better percentage of successful votes, but I am in a lower position in the rankings. Why? 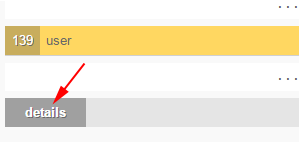 This example illustrates that a user with better percentage of successful votes will be in a lower position than a user with lower percentage of successful votes, but with more points. Which is my position in the rankings? How many points do I have? When the user is logged in and then he clicks the button "View user rankings" under "my activity" bar. The page displayed will contain the user's current rankings. Under all rankings there are button "details". When the user opens the detail report of his votes, the user can see how the points are computed, the position in the rankings, average coefficient of user's votes and so on. I do not want to participate in the rankings. Is there a way to vote but not to be in the rankings? If a registered user is logged in our site, the user takes part in the rankings automatically (when there are at least 5 votes for a period). It the user does not what to be part of the rankings, the user can logout of the site, so every vote will be made by anonymous user and will not be part of the rankings. What will happen with the points of abandoned or canceled or interrupted or rescheduled match? In this case the points of 0.00 will be used in the operation of addition or subtraction. What if there is no betting coefficients for a match? The betting coefficients change a lot. It is absolutely possible in the time of user's vote the match to be off the bookmakers and there will be no betting coefficients respectively points for the match. So in this case when a user's vote is processed and there is no betting coefficients (i.e. points) for any of 1 or X or 2, the system will accept base coefficient (i.e. points) of 1.00. The total points will be added or subtracted whether the user's vote is successful or failed. How and when are accumulated the final rankings for a period of time? With each vote the user takes part in the weekly and monthly rankings. The time period of the weekly rankings is from Monday to Sunday and for the monthly rankings begins on the first of each month to the last day of the same month. On the day after each of the periods (weekly or monthly) and only if all the matches are marked as finished, the final rankings are computed. The most important are the user points, the rankings are built by them with the most ones at the top in the descending order. If the points are equal the success percentages are taken (the higher one is above) and if the points and the success percentages are equal the most number of votes is taken for the rankings. The top three users receive badges respectively gold, silver and bronze one. What kind of badges (medals) exits? How does the users win them? According to the rankings there are two kinds of badges (medals) - monthly (illustrated from 1 to 3) and weekly (illustrated from 4 to 6). The Badges (medals) for every rankings are three types for the top three places respectively - gold, silver, bronze. Every user finished in one of the top three places receive a badge (medal). IMPORTANT: The user does not receive badges (medals) during the temporary rankings. 2 - silver - 2nd place in the monthly rankings. 3 - bronze - 3rd place in the monthly rankings. 4 - gold - 1st place in the weekly rankings. 5 - silver - 2nd place in the weekly rankings. 6 - bronze - 3rd place in the weekly rankings. What are the icons next to the name of some users? When the users vote and take part at the rankings they could win badges if they are at one of the top3 places in the final weekly or monthly rankings. So the user receives a badge (medal) and they are shown next to user's name everywhere on our site. The icon define the type of the badge and the number in the icon shows how many time this kind of badge was won by this user. There is no maximum number of won badges (medals). 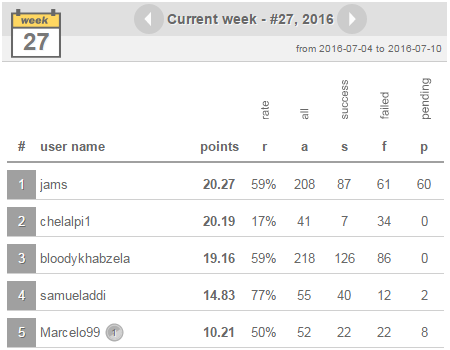 How the points are computed before week #29,2015 and month #08,2015 (OLD RANKING RULES)? Every vote is granted with the betting coefficient on the time it is made and for clarity this number is called "points". 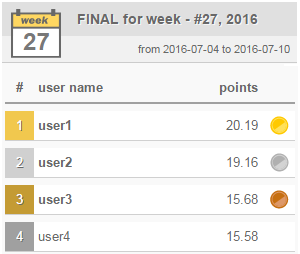 After the full time of the match and upon a successful vote the points are added to the total points of the user. Upon a failure of the vote the points of the match are subtracted by the total points. The coefficients, i.e. points for the current match, the user can see them by clicking button 1. If the user clicks button "1" it will be added/subtracted the number in the field 2. 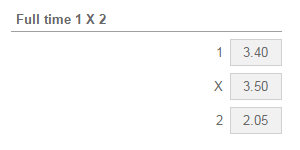 If the user clicks button "X" it will be added/subtracted the number in the field 3. If the user clicks button "2" it will be added/subtracted the number in the field 4. Whether there is an addition or a subtraction it depends by the user's successful or not vote. If the user votes by "X" for the current match and the match ends in the full time with a draw, the user's total points will be increased with 3.50 points. If the user votes by "1" for the current match and the match ends in the full time with a draw (or guest team wins), the user's total points will be decreased with 3.50 points.